Last month (April) was all-together a great month as far as poetry goes. My first – and so far, only – villanelle poem was published in one of Canada’s oldest literary journals Contemporary Verse 2: The Canadian Journal of Poetry and Critical Writing (CV2). It’s the only national poetry magazine that continues to publish four times a year and I am so excited to be included in the Spring 2016 edition. I first heard of the acceptance last year, and didn’t know which particular issue my poem would appear, so I kept waiting. After nearly a year, I was starting to wonder if it had been back-burnered forever (what should I do? Would it be a major faux-pas to query the editor? yikes). But then – as if by magic – a small, nondescript white envelope appeared in my mailbox. 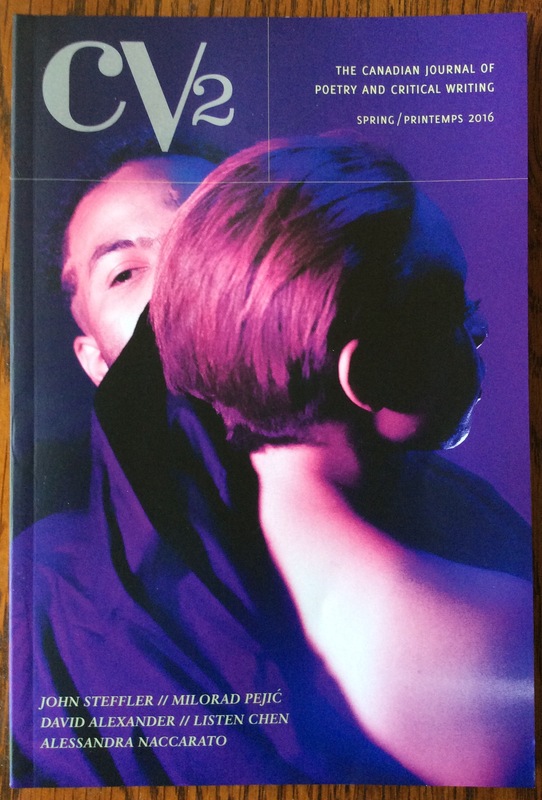 It was just thick enough to contain a magazine, and there it was – CV2’s annual poetry-only edition! 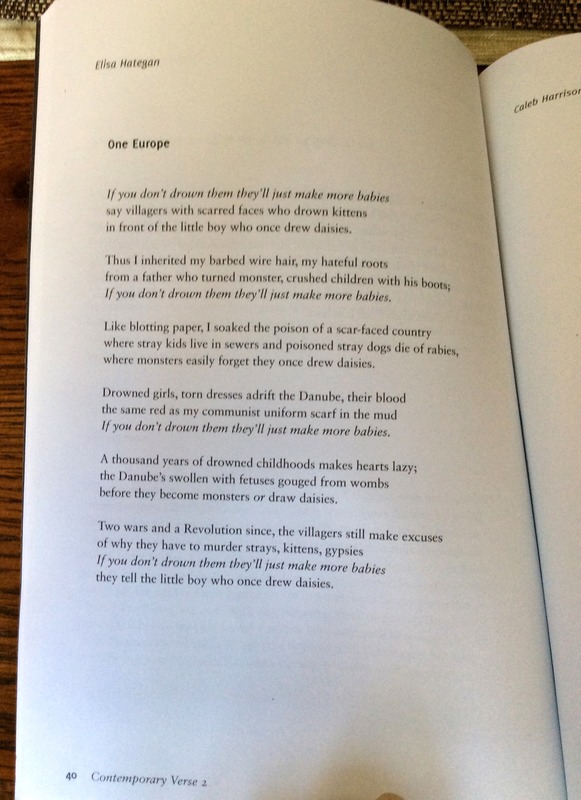 In this day of online publishing, I consider myself fortunate to have my poetry appear in print. There’s no comparison to the great joy of holding a periodical or a book in your hands, a palpable thing you can touch, smell and (after much pride and celebration) put on a shelf. If you’d like a copy, you can pick up the latest CV2 edition in any major bookstore or order it online directly from their website. I’m in the company of some really great writers! I first tried my hand at a villanelle after reading Elizabeth Bishop’s One Art, a poignant piece about loss and heartache. The most famous villanelle of all is, of course, Dylan Thomas’s eternal Do Not Go Gently Into That Good Night (one of my favourite poems of all time). Nothing compares to the sheer power and awe that poem contains, the magic cast through its hypnotic (heart)beat of repetition. I wrote One Europe soon after returning from my journey to Romania, where I researched my father’s past and tried to access his dossier from the Securitate archives. It was also an observation of the current state of emotional numbness and brutality that lingers in the post-communist era. It was a lot of work, but the joy and sense of accomplishment I felt for being able to create something this difficult complex was incredibly rewarding. My recommendation to all you poets out there is to try your hand (at least once) at an ornate, complicated archaic format just to experience what poets of other generations had to work with, back when rhyme was the only accepted form. If anything, it will whittle your words into a sharper, tighter poem. It’s worth the exercise, believe me. Given the fact that my first-ever villanelle was accepted for publication so quickly (most poems get peddled through quite a few editors before they find a home), I plan to write a few more this summer. But first, I need to work on edits for my existing pieces. This brings me to another piece of good news: a few months ago, the in-house editor at ARC Poetry Magazine recommended me for a free mentorship program with their resident poet, a renowned and very established Canadian poet who gave me some really useful tips for revising my poem Voyage to Brazil, which they are considering for publication. So hopefully (fingers crossed) it will appear in ARC sometime this year – but either way, the mentorship and keen eye was invaluable. The poem is that much stronger and powerful thanks to ARC’s help, and I’m sure it will find a home soon. And speaking of Brazil, it’s where I’ll be spending part of the summer working on my book and other poetry & research projects. Stay tuned for details. This entry was posted on May 13, 2016 at 5:35 pm	and is filed under poetry. Tagged: brazil, cv2, dylan thomas, elizabeth bishop, poet, poetry, publication, romania, villanelle. You can follow any responses to this entry through the RSS 2.0 feed. You can leave a response, or trackback from your own site.